I had a plan. And it involved being nice to myself by taking a trip to India. My publisher, and various ‘author promo’ blogs and sites, insisted that I needed to be ‘proactive’ now that my book, The Silent Monument, is out there for the world to read. And since it’s my debut in English, I was warned: be prepared for the good and the bad. Well, the good is good, but for the bad – I have adorned my thick scaly skin. – actually, here’s the real secret – the really exciting part about this particular festival is not only that I will get to see/hear the most popular and award-winning authors, but, for me, the most heart-pounding part is that this particular lit fest is graced by celebrities from the film industry. So, while I don my author hat, and hand out namecards, and talk intelligently about my latest novel, I will be canvassing for famous faces. The first day: Friday 21st January 2011. Pick-up was at the airport, and was driven to a haveli in one piece – Bissau Palace – a heritage hotel. It was dark and the the ancient structure was vaguely visible by moonlight, verandahs and corridors were shadowy enough to inspire my next book. I made a few notes, and tried to get comfortable in the high-ceilinged ornately decorated room, with two metal spears criss-crossing one wall. I managed to sleep eventfully dreaming of the spear falling on my bed…and being saved by a handsome Rajput prince, who bursts through the wooden doors and stops the spear just in time, before it impales me. As I woke up with a start, I was more concerned about my dream that involved a handsome Rajput rather than the falling sword. Needless, to say, I felt it was a good omen. Day 2: 22 January 2011: I had a leisurely breakfast in the haveli’s beautifully decorated dining room. And when I saw the corner office advertising internet service, I couldn’t resist and checked my emails. Then all set, armed with a bag containing sunglasses, water bottle and my shawl. I was ready to face the searing afternoon heat, and the suddenly cool evening temperatures at Diggi Palace hotel. Divided into four sections, there was the Durbar Hall, the Baithak Tent, the Mughal Tent and the Front Lawns – which was the largest open area for the talks. I stayed there to listen to Aisi Hindi Kaisi Hindi, and continued on to listen to The Forum- Global Exchange of Ideas. By the time it was over, and I was mentally satiated and physically starved, I headed towards the back area – bad idea – it was jam-packed. the lit fest entrance is free, and being a Saturday, there were crowds of students and other Saturday afternoon lit lovers trying to make their way, but were stuck in between. By the time my friends arrived, they were overwhelmed by the surge of humanity that were so interested in literature. We sat in the cool tented area of the baithak until it was time for the next event. I did see Gulzar and Javed Akhtar – the regulars at the fest. But, I’m sure there were more celebrities arriving by tomorrow. 23rd January 2011: Let’s just say it was the most memorable day and worth the visit. After attending a few events, we headed to the Rambagh palace hotel for coffee. And then I returned to the Diggi palace grounds to continue my ‘proactive’ routine and catch up with my publisher. 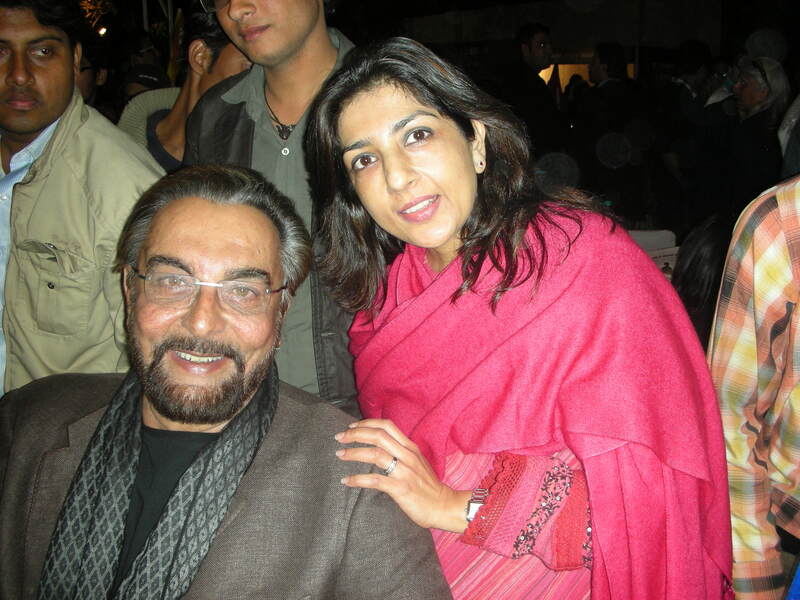 It was only in the late evening that I met Kabir Bedi – the gorgeous hunk, the handsome face of Bollywood, and my pulse raced. While I was sitting with a group of very intellectual but fun-loving ladies, I noticed the star some distance away, he was constantly surrounded by starry-eyed people like me. One of the ladies noticed my distracted looks, and I could tell by her expression that I had become glassy-eyed and fidgety. She said calmly: ‘Don’t worry, I will introduce you to Kabir.’ I almost screeched, ‘You know him?! !’ ‘Ofcourse,’ she shrugged. And gave some reason, but I don’t quite recall because the blood was rushing to my head. Next thing you know she was introducing me to Kabir Bedi, and I was chatting with him about my book, and he seemed reallllly interested! So, while I mention to all (with a serious smile) that the Jaipur lit fest was a great intellectual experience, it was also a memorable heart-throbbing finale.